Download Daemon Tools Lite for free here. It's a freeware emulator that will make your computer think that selected discs are inserted into it, even when it isn’t. If you choose to download DAEMON Tools Lite, we will notify you that this particular version is the Lite version of the full version. The full version of the program is the DAEMON Tools Pro purchase version . The DAEMON Tools Lite program is powered by advertisements that you will see when you use the program. This is not the case in the purchase version. Once you have tried the program and are happy with it, you can always consider spending money on the purchase version. There are also a number of extra features that will be discussed later in the notification. 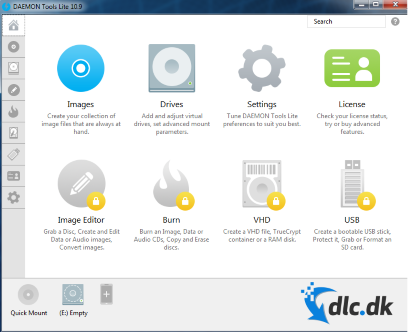 You can also read our review via DAEMON Tools Pro via the link . If you already think that the program DAEMON Tools Lite seems to be something for you, then we will give you a brief overview of the program's accessibility. The DAEMON Tools Lite program is designed for the Windows system. If you own a Mac instead, read more about your options for downloading DAEMON Tools Lite on the manufacturer's official website via the link . Before we give you an insight into how you use DAEMON Tools Lite, we want to emphasize how simple the installation process of the program is. The installation does not take more than a few minutes, and you can thus quickly be allowed to throw yourself into testing the program's functions. The program's menu bar is located on the left side of the user interface. It is this that you will primarily use. By exploring the menu bar, you will also quickly get an idea of what features are available to you when you download the Lite version of the program. The main feature of the program is that you can insert various CD / DVD / Blue-ray discs and thus imitate them so that you do not have to insert the individual discs into your computer every time you need them. 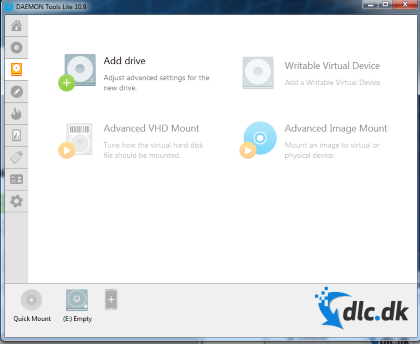 If you need to add more virtual drives to your computer, DAEMON Tools gives you the opportunity to do so. You can add up to four different drives to your computer through the program. You can see in the GIF below how to find this function, namely via the sub-function 'Image Editor'. You can also use this feature, regardless of the format you work with. This applies to both pictures, games and movies that you need to save via the program. As we previously described, DAEMON Tools Lite is a free version of the original program, DAEMON Tools Pro, which is why there are a number of functions that do not belong to the Lite version. However, this does not matter if you are just looking to imitate CD / DVD drives directly on your computer. You can easily do this with the Lite version. Is it the first time you are considering downloading a programWith the purpose of imitating CD / DVD drives, the limited selection of features in the Lite version of the program can be an advantage for you, because the program therefore becomes more manageable. You can only focus on the few features that are relevant to you. This helps to increase the user-friendliness of the program. If you also appreciate a simple design, DAEMON Tools Lite is definitely for you. The design of the program is simple, which also makes it easier to navigate around. If you are after some time and are considering whether you should try the purchase version of the program or just some of the extra functions that you can buy, you can look at these in the DAEMON Tools Lite program, which you can see in the above GIF. DAEMON Tools has been on the market for many years, so you can be sure to download a program where the manufacturer has great experience with this particular type of program. In this connection, the DAEMON Tools programs are also among the best on the market because they are just as focused on what they offer their users - namely to imitate CD / DVD drives. The manufacturer further ensures that the programs are continuously developed so that you get a better user experience. In addition, the DAEMON Tools Lite program is regularly updated, and in these updates there will typically be emphasis on design improvements, but of course also optimization of speed. DAEMON Tools Lite allows you to take advantage of games, programs and files from the web, even if you do not have the physical disk. It is thus a smart tool that can help you with a specific problem. In our category addressed smart "tools" we have compiled a number of interesting programs, which like DAEMON Tools Lite can be exciting to take a closer look at. You can find the category by clicking here . We will finally summarize the benefits that come with DAEMON Tools Lite and whether we can recommend you to try the program. 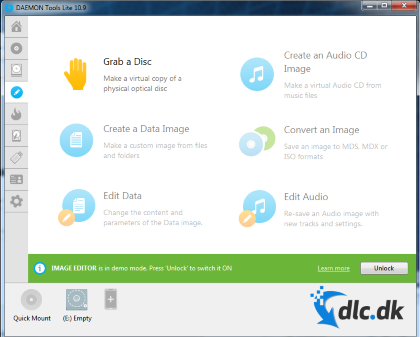 If you need a program that can efficiently and free imitate CD / DVD drives on your computer, then DAEMON Tools Lite is a great deal for a sensible piece of software that can handle this for you. The program has few but excellent features that are easy to navigate in. The program has a simple interface that you will quickly get to know. In addition, you can use DAEMON Tools Lite, regardless of which user level you may be in - beginner or advanced. We can therefore recommend that you download DAEMON Tools Lite if you are looking for a focused piece of software. Find Daemon Tools Lite, mark it and choose "Uninstall"
Should Daemon Tools Lite has been damaged or corrupted and thereby difficult to remove we can recommend you finding help to uninstall it here.